Thomas Dunne Books, 9780312597054, 336pp. Sicily is the Mediterranean's largest and most mysterious island. Its people, for three thousand years under the thumb of one invader after another, hold tightly onto a culture so unique that they remain emotionally and culturally distinct, viewing themselves first as Sicilians, not Italians. Many of these islanders, carrying considerable DNA from Arab and Muslim ancestors who ruled for 250 years and integrated vast numbers of settlers from the continent just ninety miles to the south, say proudly that Sicily is located north of Africa, not south of Italy. 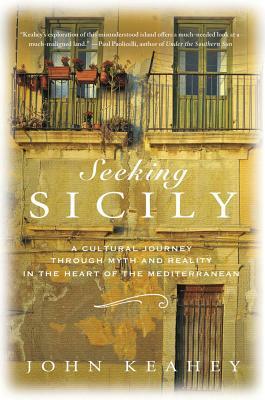 Seeking Sicily explores what lies behind the soul of the island's inhabitants. It touches on history, archaeology, food, the Mafia, and politics and looks to nineteenth- and twentieth-century Sicilian authors to plumb the islanders' so-called Sicilitudine. This "culture apart" is best exemplified by the writings of one of Sicily's greatest writers, Leonardo Sciascia. Seeking Sicily also looks to contemporary Sicilians who have never shaken off the influences of their forbearers, who believed in the ancient gods and goddesses. Author John Keahey is not content to let images from the island's overly touristed villages carry the story. Starting in Palermo, he journeyed to such places as Arab-founded Scopello on the west coast, the Greek ruins of Selinunte on the southwest, and Sciascia's ancestral village of Racalmuto in the south, where he experienced unique, local festivals. He spent Easter Week in Enna at the island's center, witnessing surreal processions that date back to Spanish rule. And he learned about Sicilian cuisine in Spanish Baroque Noto and Greek Siracusa in the southeast, and met elderly, retired fishermen in the tiny east-coast fishing village of Aci Trezza, home of the mythical Cyclops and immortalized by Luchino Visconti's mid-1940s film masterpiece, La terra trema. He walked near the summit of Etna, Europe's largest and most active volcano, studied the mountain's role in creating this island, and looked out over the expanse of the Ionian Sea, marveling at the three millennia of myths and history that forged Sicily into what it is today.